GALION — It might not have been the prettiest game he’s watched his team play, but after surviving at home against Fredericktown by a 44-38 margin on Wednesday, Northmor coach Zach Ruth was simply happy to get a tournament win over a league rival. One of those pieces, Jacob Booth, got the Freddies out to a fast start, scoring his team’s first eight points and staking them to an 8-3 lead. The Knights still trailed 13-7 late in the first quarter, but would hold Fredericktown for a period of time stretching over eight minutes during the first and second quarters. A pair of three-pointers by Brock Pletcher, as well as short-range shots from Tyler Kegley and Alijah Keen, put Northmor in front 17-13 after the opening period ended. They would then open the second quarter with one free throw from Kyle Kegley and two free throws by Keen to take a 20-13 advantage with 5:44 remaining in the second quarter. They would not score again in the half, though, as the Freddies battled back to tie the game at 20 going into the intermission. Ruth felt his team’s offensive problems simply came down to not hitting shots, adding that his team’s defense and rebounding were the difference on the night. Both teams jockeyed for the lead in the third quarter. Booth opened the period with five points to help stake his team to a 27-23 lead, but Northmor came back behind a basket by Pletcher, a three-pointer from Demetrius Johnson and a free throw from Keen to move in front by a 29-27 count. However, with the score 31-29 Northmor, Fredericktown got back-to-back baskets from Trace Hatfield to hold a slim lead going into the final eight minutes. 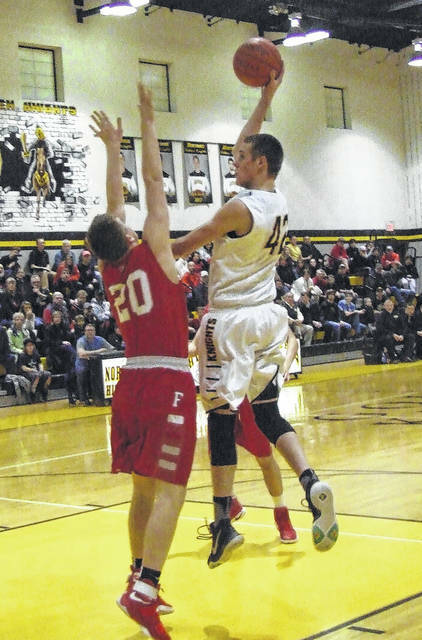 Northmor immediately regained the lead, as Keen and Kyle Kegley hit back-to-back shots in the opening minute of the fourth, but a three-pointer by Nick Cunningham put Fredericktown back on top. The Freddies still held a 38-37 lead with 2:28 to play, but they would be kept off the scoreboard for the remainder of the game. While Northmor didn’t score from the field during that time, they did do a good job of drawing fouls and making them count. Kyle Kegley gave the Knights the lead with two free throws and then Johnson and Tyler Kegley combined to make 5-of-6 in the final minute of play to clinch the win. Johnson finished with 16 points to lead Northmor, while Pletcher added eight. When the contest was over, Ruth simply was happy his team was able to survive. Tyler Kegley goes up for a hook shot in Northmor’s sectional win over Fredericktown Wednesday. Northmor’s Nate Hall prepares a pass in action from Wednesday.